Nope. Never been. 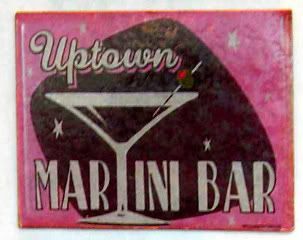 In fact, I'd like to even tell you the Uptown Martini Bar once existed. But I haven't a clue. I found this at a vendor I discovered over at Union Square. Seriously, I emerged from the subway and there, in the bright sun, like manna from heaven and a chorus of angels ringing in my ears, was a guy, setting up a table of magnets. This table of magnets. Well, ok, so maybe there was no chorus of angels, nor any manna. Also, I could have sworn the bright sun was there, but looking at that picture, apparently, memory hath made my heart grow fond. Anyway. I picked this for today, because it's just been one of those weeks, and I'm sorely hoping to get someone to run across the street with me to try this Stoli Darkening Theater cocktail. The mixologist over at B.R. Guest restaurants wanted to create something in honor of the Tribeca Film Festival - so it's a cocktail concocted out of Stoli, infused with popcorn, with salted coke syrup and lemon, and garnished with caramel popcorn. It sounds like something I don't want to be near, but ya'll know I love my TFF, so I feel like I need to give it a try. Not bad. Not bad. It tastes like your Coke does during that last 30 minutes of the movie. Didn't look like the picture, but the caramel popcorn was darn good. Wow, that drink sounds like 8 kinds of nasty simultaneously exploding in your mouth. I don't even like martinis to begin with, so I think I'll steer clear. Also--who decided it was a good idea to put a relatively potent drink in the world's most spill-y-est glass?? ?